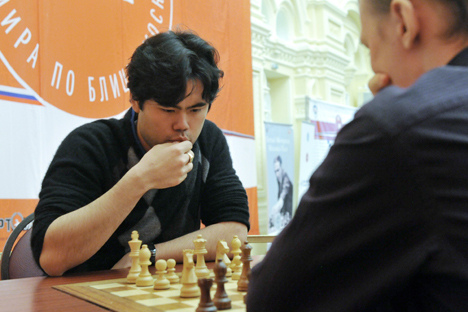 American grandmaster Hikaru Nakamura wins speed chess event at Moscow’s Digital October. Ten of the world’s top chess players faced off in Moscow for a $15,000 speed tournament Wednesday, with American grandmaster Hikaru Nakamura triumphing at the Digital October high-tech start-up center. The speed event was the curtain-raiser for the main event – the 8th Tal Memorial chess tournament, which is being played regular time limits from June 13 to June 24, with a rest day on June 16. Most rounds start at 3pm Moscow time, with spectators welcome to watch the games with commentary from a spectators’ hall at Digital October. Nakamura finished the speed tournament with 7 points from 9 games, ahead of reigning World Champion Vishy Anand, Russia’s top player, former world champion Vladimir Kramnik, and the world’s No. 1 rated player, Magnus Carlsen of Norway. The tournament, named after Mikhail Tal, one of the Soviet Union’s most-loved world chess champions, attracted hundreds of chess professionals and enthusiasts to Digital October, within Moscow’s Red October complex of trendy business centers, cafes and design studios. Boris Spassky, the legendary world chess champion who fought Bobby Fischer in the 1972 ‘Match of the Century,’ was the event’s guest of honor. Now 76, a frail-looking Spassky watched the games on large display screens. Noticeable by his absence as a spectator and commentator from this year’s Tal Memorial will be Garry Kasparov, the world champion-turned-opposition politician, who recently declared he would not return to Russia, but instead live in exile. In the speed tournament, Nakamura was the most consistent player, making draws against the four leading players and defeating the next five. Carlsen, 22, the world’s No. 1 player by rating, failed to reproduce his usual invincible form in the blitz tournament. He will play India’s Anand, rated No. 4, for the World Championship in Chennai, India, in November. The most spectacular victory of the event was scored by Russia’s Alexander Morozevich, who dramatically forced Carlsen’s resignation in their individual game due to the threat of checkmate with queen and knight. Video coverage of the speed chess tournament, and live coverage of the whole Tal Memorial tournament, can be seen on the Russian Chess Federation’s website.